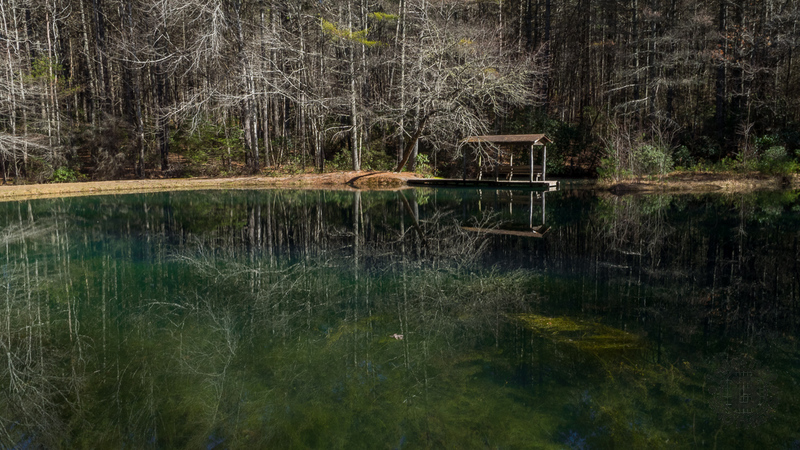 Located in the heart of DuPont State Forest, Three Lakes Trail does exactly what its name implies… it takes you to a trio of very picturesque lakes near Conservation Road. Lake Dense is an ideal stop for a family picnic. Lake Alford, really more of a pond, may be the most vivid and charming of all. The largest, Lake Julia, is breathtaking from every angle. Add to this a stroll along Pitch Pine Trail to reach the lakes, and a visit to Bridal Overlook afterward, and you can make a delightful day in the woods of DuPont State Forest. I enjoyed this hike on Sunday, February 7, 2016 from 11:00AM to 3:00PM. My plan was to take Pitch Pine Trail to Three Lakes Trail, then on to Barn Trail and Shelter Rock Trail to reach Bridal Overlook Trail. My return was on Conservation Road. Hike Rating: Moderate, mostly for distance and a brief strenuous climb to Bridal Overlook. Otherwise, this is pretty easy. Trail Condition: Excellent. All trails at DuPont are outstanding. Starting Point: Visitor Center on Buck Forest Road. Trail Traffic: When on the trails, I had it almost all to myself. When on Conservation Road there were dog walkers, horseback riders, mountain bikers and other hikers. How to Get There: DuPont State Forest can be accessed from Hendersonville via Kanuga/Crab Creek Rd., from Asheville/Brevard via US64 and Little River Rd., or from Greenville, SC via Cedar Mountain and Cascade Lake Rd. Buck Forest Road takes you to the Pitch Pine trailhead on Conservation Road. Conservation Road slices through the center of DuPont State Forest. It is accessed via Buck Forest Road from the Visitor Center. As I crossed the covered bridge over Little River, I noticed that the river had apparently flooded during the heavy rainstorm earlier in the week. The woods to the south of Buck Forest Road had a couple feet of standing, swampy water with a thin sheen of ice. It reminded me of my youth running around the bayous of southern Louisiana. A few hundred yards up Conservation Road is the trailhead for Pitch Pine Trail. This twisty path is a means of getting off the road and into the woods for a connection with Three Lakes Trail. Pitch Pine passes the occasional large boulder imbedded into the ground as if giants had once played a game. Keep your eye out for mountain bikers winding through the forest. Don’t want a collision. Pitch Pine crosses Joanna Road then comes to the northern tip of Lake Dense a few hundred yards later at Three Lakes Trail. It is 1.1 miles total from the trailhead to Lake Dense. I remembered my last trip to this grassy area when I got stung by a yellow jacket. None of them around on this chilly and breezy February day, thank goodness. Lake Dense is no more than 2-3 feet deep and surrounded by a young pine forest. As you walk the north shore toward the picnic area the squishy ground is an indicator that the size of the lake ebbs and flows. A handful of ducks quacked their displeasure at my appearance from the middle of the pool. 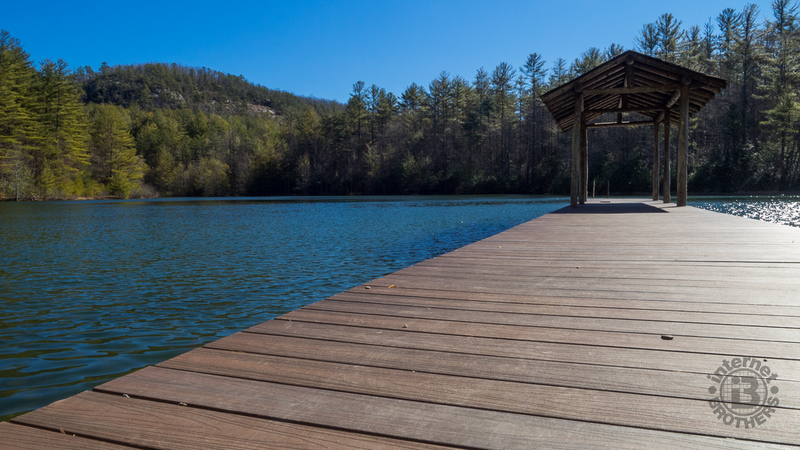 The west end of Lake Dense is a wonderful family attraction with a picnic shelter, two piers for swimming and diving, and of course fishing. Standing tall above the lake is the rugged cliff face of Joanna Mountain to the east. There was not a soul around as I wandered the rim of the lake. The breeze created ripples on the surface that shimmered in the mid-day sunlight. I imagined the gleeful screams of children as they jumped and splashed on a warm summer day. Today it was in contrast… peaceful and serene. The only reminders were the bluebird sky and the ghosts of summers past flittering on the wind. I headed south and then east, back into the woods and on to the next destination. Lake Alford is three-tenths of a mile farther along the Three Lakes Trail. On the way is a hemlock restoration study area. The eastern hemlocks in DuPont have been decimated by the woolly adelgid blight that has infested nearly all hemlock forests in the Southern Appalachians. In this study area some hemlocks are being chemically treated, while others are biologically controlled by predator beetles. Unfortunately there aren’t enough living hemlocks left for a full recovery, but NC Forest Service specialists are studying the results of their remediation work to protect other groves throughout the state. Lake Alford is the smallest of those along this excursion, just a half acre in size, more of a pond really. But I found it to be perhaps the most picturesque of all those I’ve seen scattered throughout the state forest. It too has a pier with benches for calmly sitting with your thoughts on a colorful autumn day. This would be a great place to bring a drawing pad to sketch the tall pines that surround the surface of this collection of emerald tears. Moss and lichen at the bottom of Lake Alford give the pool its verdant appearance as it reflects the surrounding treeline. Three Lakes Trail continues south at first for two-tenths mile, then turns westward along the shoreline of 100-acre Lake Julia. On the way I passed beneath a sapling bent over the trail like an arch, in a half-moon shape. Julia is by far the largest of the lakes in DuPont State Forest. From the overlook along Three Lakes Trail you can see the ranger station on the opposite bank, and the picnic area that is at the terminus of the Reasonover Creek Trail. The trail follows the Lake Julia Spillway and then itself spills back onto Conservation Road for a short stretch. After crossing a bridge, you can walk up on top of and across the dam that retains Lake Julia, but don’t bring your bikes or horses. They aren’t allowed. On the other side of the dam it’s back again onto Conservation Road for a half mile or less. On this day I passed by Bridal Veil Falls Road (been there, done that) and instead turned right at the next opportunity onto Barn Trail. This goes past the same horse barn seen from Bridal Veil Falls Road. During the green season the barn, or stable, is usually jumping with equestrian activity, but it is quiet in winter. Barn Trail plunges back into the forest before meeting Shelter Rock Trail and continuing south to the power transmission line that dissects the southern region of DuPont. Shelter Rock Trail very briefly crosses Corn Mill Shoals Trail before reaching the junction with Bridal Overlook Trail. Take a right here to climb northward up the hill alongside the power lines. This is the only somewhat strenuous stretch of this entire hike, climbing approximately 240 feet. Once you reach the top of the hill the trail once again crosses the power lines and opens to a magnificent vista of the distant Pisgah National Forest and the iconic pointed summit of Mt. Pisgah itself far in the distance. Once on the other side it’s another short climb up slick granite surface to the top of a knob known as Bridal Overlook. Directly below is the roaring sound of Little River as it cascades over Bridal Veil Falls. You can see the Vulcan Rock Quarry all the way out on Hwy 64 between Etowah and Brevard, and the meadows and farmland of the Little River community. Bridal Overlook Trail dead-ends, and as tempting as it might be, you can’t get to the falls from here. It’s a long way straight down. I paused at the outcrop overlook to enjoy lunch and the wonderful mountain view, but the cold breeze got the best of me after awhile and it was time to head back. I took Shelter Rock Trail back to Conservation Road, then in the interest of time decided to stay on the road all the way back to Buck Forest. As I walked along, I was treated to a salamander giving it his all to cross the road, a variety that I’ve never seen before. A little Googling found this little guy to be a scout salamander. His dynamic yellowish-orange spots were the identifier. See the photo in the gallery below. In summary, this is a great hike to combine a little bit of everything offered by DuPont State Forest. Because I hiked more than eight miles I got some great, relaxed exercise because it wasn’t overly strenuous. Along the way I experienced three lakes, two waterfalls, and a fabulous overlook with viewing that stretched all the way to the Pisgah Ridge. Particularly the Pitch Pine and Three Lakes Trails would be ideal for all family members, and even great for a picnic as well. This area of DuPont can be somewhat crowded in summer, but I had the trails nearly all to myself in winter. I definitely look forward to going back to Lake Alford in both spring and fall. Updated May 25, 2016: Time for a Spring trip to Three Lakes. Ken and I just happened to hit the mountain laurel at near peak bloom, a delightful addition to the already picturesque trails through this part of DuPont. Unfortunately the lake surfaces were covered with algae and grass clippings, so the usual mirror-like sheen wasn’t as pristine as normal. There isn’t much to see of Bridal Veil Falls from the overlook when leaves are on the trees, but there is still a very nice long distance view of Pisgah Ridge, far away to the north. The weather was delightful… the company too. Here’s a new photo gallery for you to compare seasons. Updated December 21, 2016: How about one more photo gallery of this delightful hike at DuPont State Forest? This one on winter solstice 2016. Cold, cold in the morning, but absolutely glorious in the afternoon.